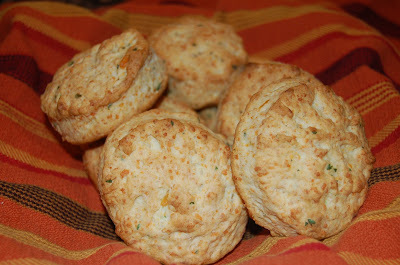 I made these delicious biscuits last weekend. I was flipping through a William's Sonoma baking book that I got from Chad's aunt for Christmas, and it just stood out to me. It really didn't take long at all (maybe 30-40 minutes start to finish), and was very simple to assemble. I modified the original recipe by using parsley instead of the recommended chives. I really think the original recipe could be modified a bunch of different ways to accommodate your taste. I don't have a biscuit cutter (which with all the gadgets I do have makes me wonder why I don't own this) so I used a glass to cut the 3 inch circles. I made some turkey sausage patties, and we enjoyed a cheddar parsley biscuit sandwich. Very yummy! 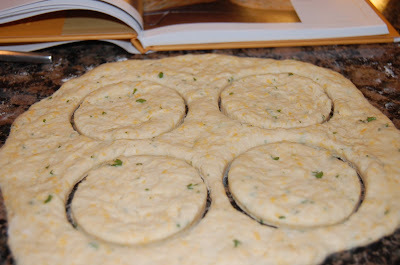 In a large bowl, stir together the flour, baking powder, salt cheese and parsley. Use a pastry blender or 2 knives and cut in the butter cubes. Mix until coarse crumbs form (the size of peas). Add milk and stir until evenly moistened and uniform. Lightly flour a work surface and turn out the dough. Knead a few times and shape into a ball. Pat it into a circle about 3/4 of an inch thick. Using a 3 inch biscuit cutter (or glass like I used) cut out as many biscuits as you can. Take the scraps and form another ball and pat to 3/4 inches thick, repeat the cutting, using as many as the scraps as you can. This should give you about 12 biscuits. Put biscuits on baking sheet about 1 inch apart, and bake for 15-18 minutes, or until they are golden. Let cool slightly and EAT! I'm devastated that I got a Williams Sonoma baking book for the holidays and this was most certainly not in it ;-( I bet yours has loads of other goodies too. Guess I should put this one on the wish list. This looks like a fabulous recipe! 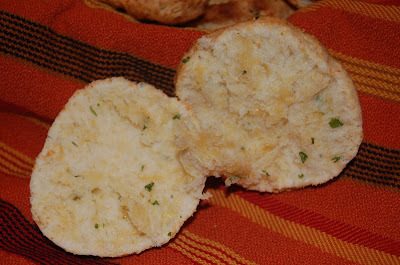 Ooooh, I love cheddar and herb biscuits. These look great! Those look so fluffy and good. These look amazing! Thanks for sharing Ally.